Swiss startup MindMaze is moving its technology from the medical field to the mainstream with a virtual reality headset that reads the wearer’s brain waves and uses the data to help them relax and play. The team announced $8.5 million in angel funding today, which it will use to help bring several products to market by the end of the year. At the Game Developer Conference in San Francisco, I tried four prototypes that demonstrated how MindMaze’s technology works on different platforms. Inside a virtual reality headset MindMaze calls “NeuroGoggles,” I saw virtual fire spring from the tips of my fingers in an augmented reality mode. Plastic strips placed EKG sensors all over my head, allowing a TV next to me to livestream my brain activity. A prototype version of MindMaze’s NeuroGoggles. At another table, a sweatband studded with sensors measured my relaxation and allowed me to power up a glowing ball on the screen in front of me. I furrowed my brow to release its energy and battle a MindMaze employee in a reverse tug-of-war. MindMaze also has a Kinect-like camera that tracked my movement in 3D. The company has plans for it similar to Leap Motion; a gamer could use it to integrate their motions into their virtual avatar, for example. 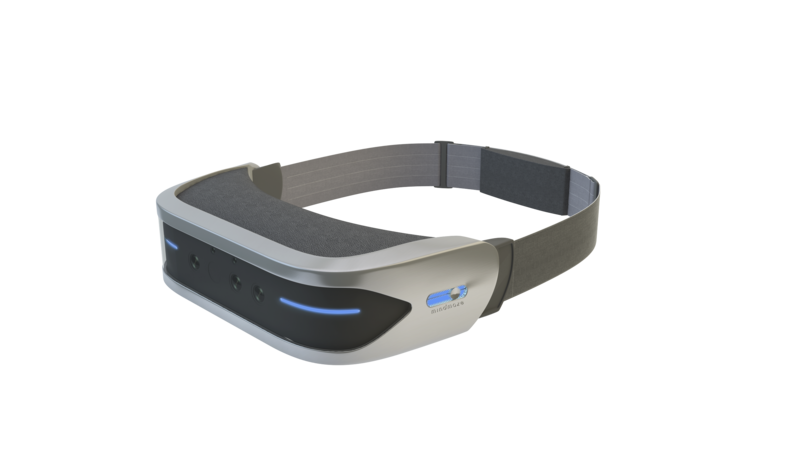 A prototype MindMaze headband reads brainwaves and incorporates them into games. MindMaze got started by using its 3D tracking technology to help stroke, amputation and spinal cord and brain injury patients. There’s an episode of “House” where Hugh Laurie discovers a man’s anger stems from pain in his amputated hand. He alleviates the man’s pain with a box split down the middle by a mirror. One arm goes on each side of the mirror, and when the patient moves their intact hand it appears their other hand is moving too. Studies have not found conclusive evidence that mirror boxes actually alleviates phantom limb pain, but it has been shown to help stroke patients regain control of their limbs. MindMaze replicates the same treatment with a virtual limb. The patient moves their intact hand, and a mirrored virtual hand can perform the same action. A rendering of the proposed design for MindMaze’s NeuroGoggles. When MindMaze begins selling its devices to consumers, CEO and founder Tej Tadi said he sees people using it both to manage their mental health and for gaming. In the tug-of-war, it was nearly impossible to relax and power up because journalists don’t relax and the room was buzzing with people. I’ve tried the Muse headband in the past and wasn’t particularly impressed. Feedback reminding me I’m not doing well at relaxing doesn’t exactly make me more relaxed. 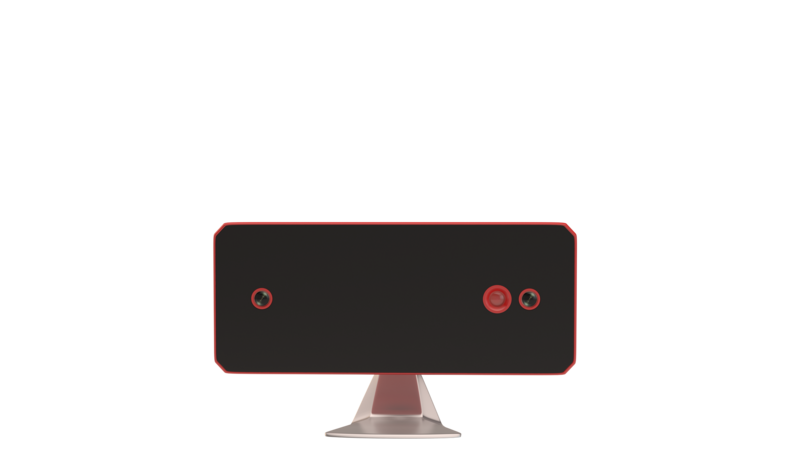 A rendering of the proposed design for MindMaze’s motion capturing camera. But I like the idea of relaxing inside virtual reality. It is especially suited to blocking out the world and putting you in a space where it is possible to be calm. MindMaze’s prototype goggles were decently made and had the unusual feature of displaying 180 degrees of your view in virtual reality and the other 180 in augmented reality, making it easy to switch back and forth between the virtual and real worlds. The company has plans to make its headset and 3D camera smaller and wireless, and both are meant to look a whole lot spiffier before their consumer release. I’m interested to see what other applications MindMaze dreams up.